The New York Times serves up some tasty, Thanksgiving themed info-graphics today: What’s Cooking on Thanksgiving -or- what people are searching for on Allrecipes.com on Wednesday (broken down by state). 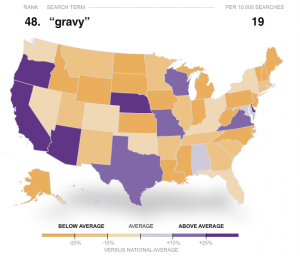 Based on a cursory look at the graphics, it appears that mashed potatoes and gravy are going to be on a lot of tables in California today. I love California.